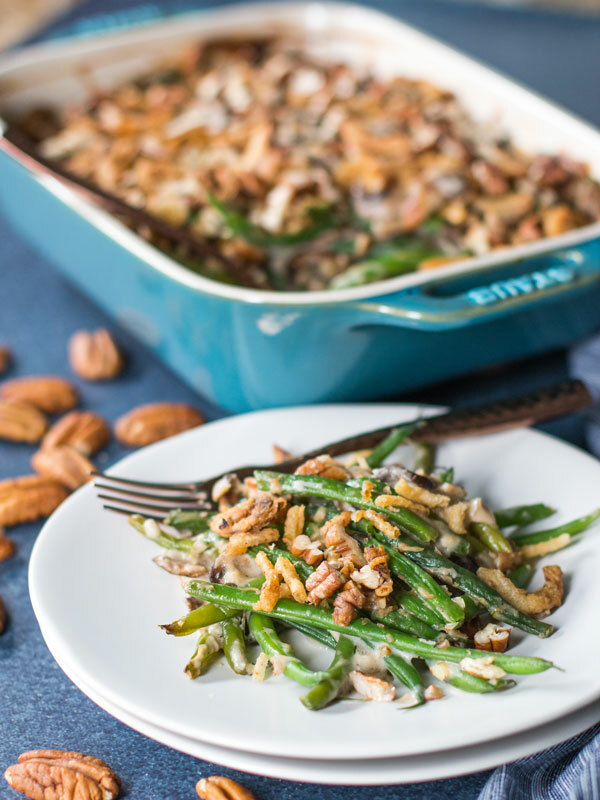 This traditional green bean casserole is topped with fried onions and crunchy pecans. The key is making a homemade cream of mushroom soup to make this the best ever green bean casserole. I’ve got a traditional green bean casserole recipe that you guys are going to love. 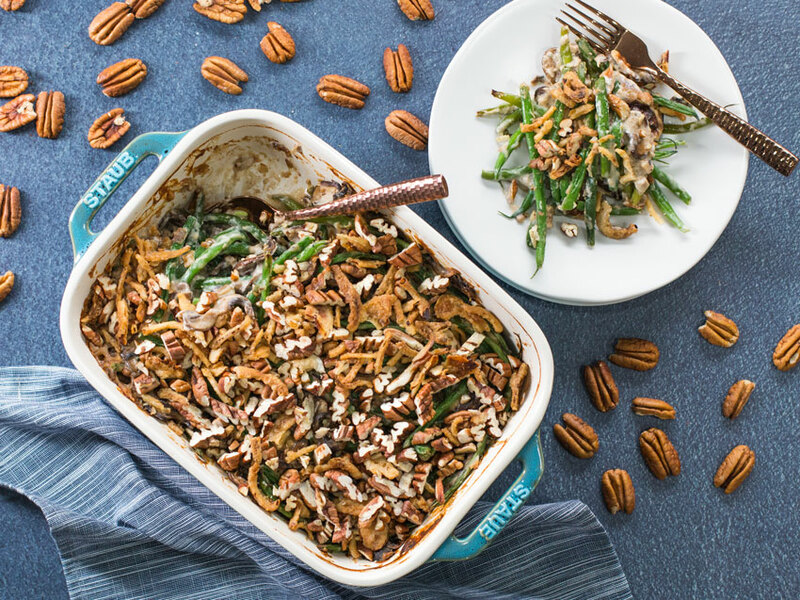 It’s creamy, loaded with mushrooms, and topped with a crunchy pecan and onion topping. The best part of this homemade green bean casserole recipe is that instead of using cream of mushroom soup from a can, we are going to make a homemade version that is way better and easy to make. This recipe is a collaboration with my friends over at the American Pecan Council. It turns out this year was a tough year for the pecan industry between hurricanes and tariffs. So that means we should show these American family farmers our support this holiday season! This year, American Pecans are hosting the first-ever Pecan-A-Thon, an entertaining variety show to celebrate the versatility of America’s native nut starring actress and comedian Wendi McClendon-Covey, pecan growers, and yours truly. Tune-in on November 20th on AmericanPecan.com/PledgePecans to get inspired with holiday dishes and décor to make this entertaining season spectacular. The Pecan-A-Thon is meant to encourage people to #PledgePecans – that’s a promise to add one pecan-friendly recipe beyond the pie to your table this holiday – and support local pecan growers and their families. Pecans are not just for baking my friends, their crunchy and buttery texture makes them great for savory recipes. Plus, they are very nutritious and are among the highest in “good” monounsaturated fats. I really want to encourage you to take the #PecanPledge this season and incorporate pecans into more holiday recipes, beyond pecan pie 😉! 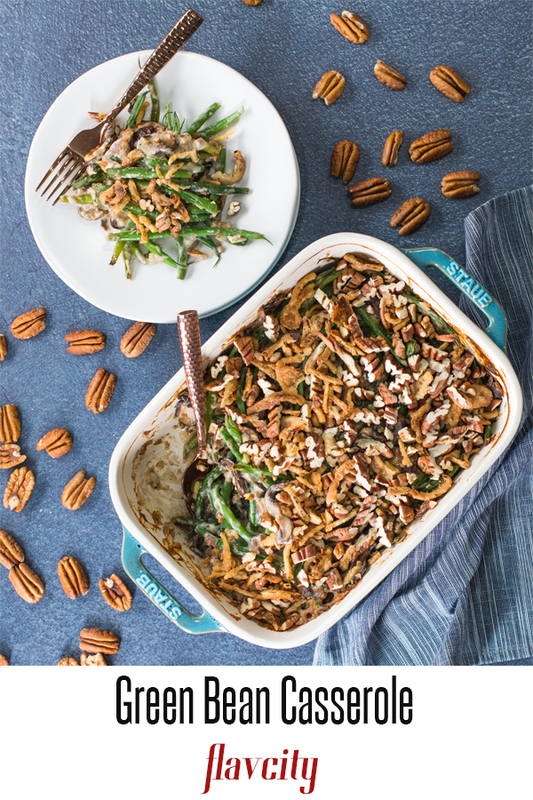 You can even make this pecan-crusted green bean casserole! 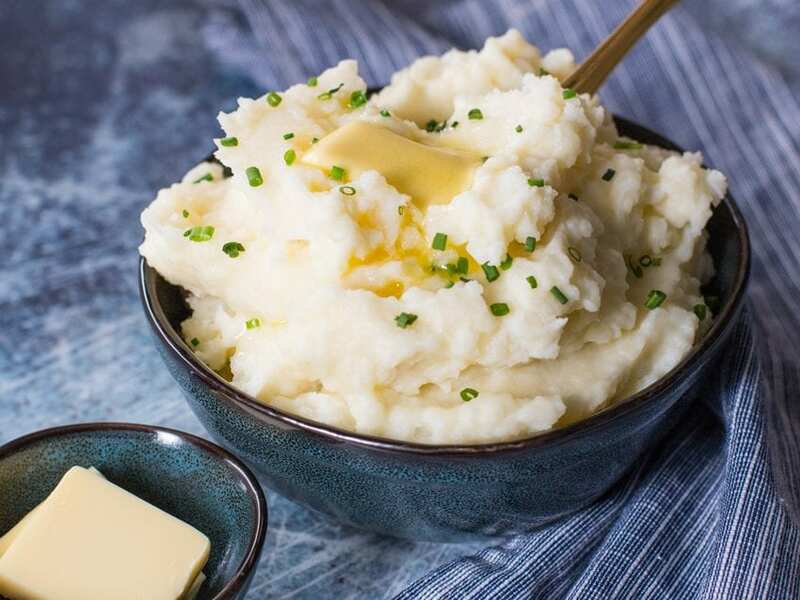 Make sure you check out my other Thanksgiving and holiday recipes like my prime rib roast and best ever mashed potatoes. 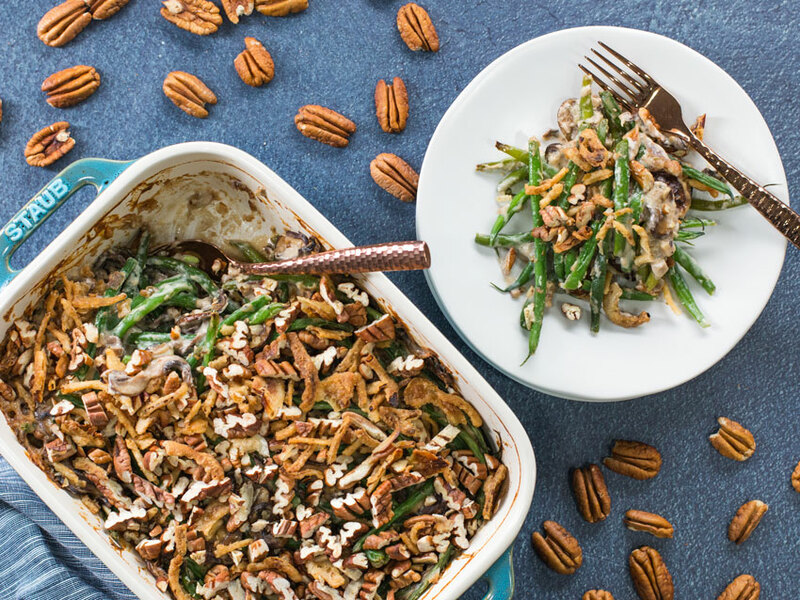 The first thing you need to do for this green bean casserole recipe is make the homemade cream of mushroom sauce. Cook some button or cremini mushrooms in butter with thyme and after 8 minutes add some chopped onions and garlic. After the veggies have softened and wilted down, turn the heat off and set aside. In a clean medium size pot, make the roux by adding equal parts unsalted butter and all-purpose flour. Whisk the roux and allow it cook for 5-7 minutes before adding whole milk and cook that for 8 minutes or until it has thickened up and coats the back of a spoon. Season the cream sauce with a good pinch of salt and pepper and combine with the mushroom mixture. Check for seasoning as you may need more salt and pepper. What Kind Of Green Beans Should I Use For A Casserole? The best type of beans to use for a green bean casserole are French or haricot vert green beans. They have already had the ends trimmed which will save you some time, and that is always a good thing around the holidays. Boil the green beans in salted water for 3 minutes, drain, and immediately move them to an ice bath to soak for 3 minutes. This will stop the cooking process and help to maintain the bright green color of the green beans. Combine the chilled green beans with the homemade cream of mushroom soup mixture and mix well. Once again, check for seasoning and adjust if needed. Place everything in a baking dish, cover with tin foil, and bake in a preheated 350 degree F oven for 25 minutes. Remove the tin foil and bake another 1-15 minutes or until hot and bubbly around the edges. How To Make A Topping For Green Bean Casserole? A traditional green bean casserole is topped with fried onions. To up the crunch level even more, I add some fresh pecan pieces as well. Bake the green bean casserole another 10-15 minutes until the pecans are golden and the edges of the casserole and brown. The pecans are not only crunchy, but soft and buttery inside, and when it comes to American tradition, pecans are about as real deal as they get! 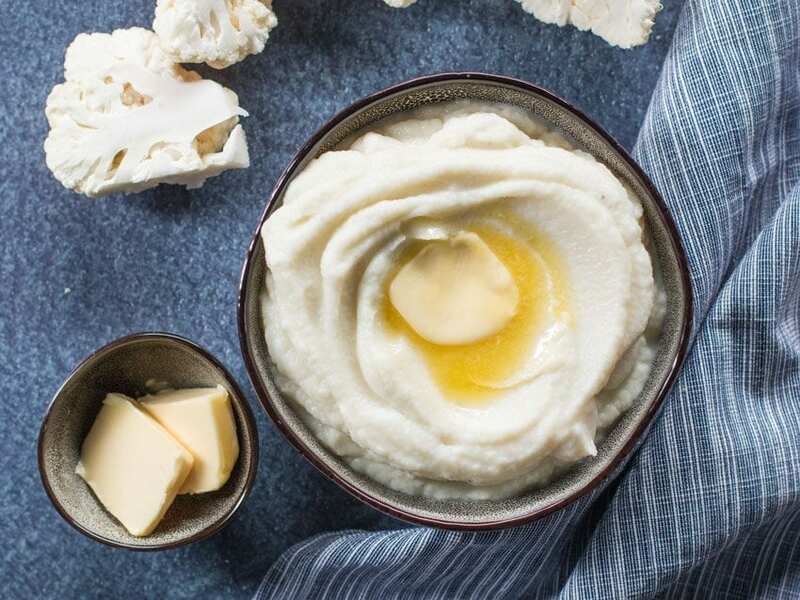 How Do I Make Cream Of Mushroom Soup? Making homemade cream of mushroom soup is easy and much better than that stuff from the can. Just cook 1.5 tablespoons each of butter and flour together for 5-7 minutes over medium heat then add 1.5 cups of whole milk and whisk well. Cook for 7-10 minutes until the cream mixture has thickened up a bit and set aside. 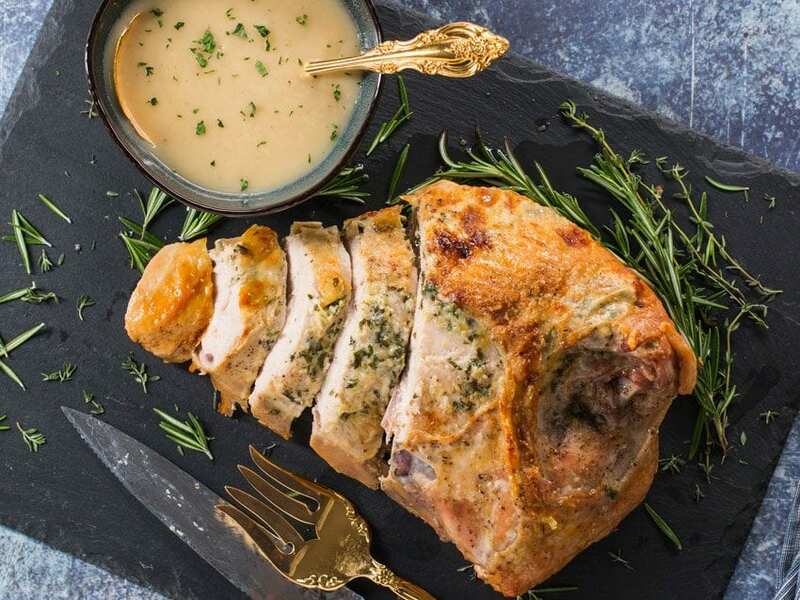 Meanwhile, cook one pound of cremini or white mushrooms with 1 tablespoon of butter and some fresh thyme until golden brown for about 7 minutes. Add ½ cup of chopped onions, garlic, and cook another 5 minutes. Combine the mushroom mixture with the cream sauce, and you just made the best homemade cream of mushroom soup ever! Preheat oven to 375 F and pre-heat a large non-stick pan over medium-high heat along with 1 tablespoon of butter. Add the mushrooms and cook for 7 minutes, until the moisture has evaporated and they are slightly golden in color. Reduce heat to medium and add the onions, thyme, garlic, ½ teaspoon salt, a couple cracks of pepper, and cook for 5 minutes more. Set side. Cook the green beans in a large pot of salted boiling water for 3 minutes, drain and transfer to an ice water bath for 3 minutes, drain and set aside. Meanwhile, make the cream sauce by melting 3 tablespoons of butter in a medium size pot over medium heat and then add the flour. Cook for 3-5 minutes, stirring the whole time, until the flour is medium blonde in color. While whisking, add the milk and cook for 7 minutes, or until sauce has thickened up a bit and is saucy. Place the green beans in a large bowl, cover with the mushroom mixture and pour all the cream sauce on top. Mix well, place in a baking dish, arrange in one even layer and cover tightly with tin foil. Bake in oven for 25 minutes, remove tin foil and bake another 15 minutes. Cover with casserole with the pecan pieces and fried onions and bake for 10 minutes until the pecans are toasted and the edges of the casserole are bubbling. Serve immediately or set aside for later and re-heat in the oven, enjoy!